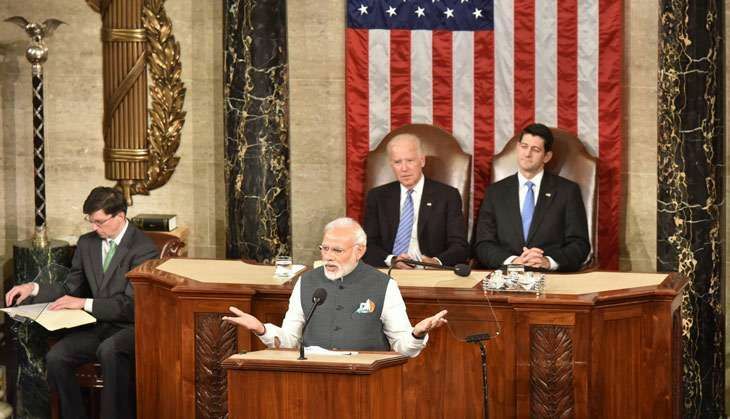 Prime Minister Narendra Modi addresses a joint sitting of the US Congress in Washington on 8 June and in doing so, became the fifth Indian to have this honour. He talked about cross-border terror, congratulated the United States for promoting democracy across the world and said that together "India and the US together can make a difference. Below is the full text of his speech, which garnered more than just a couple standing ovations. I applaud ...India applauds, the great sacrifices of the men and women from 'The Land of the Free and the Home of the Brave' in service of mankind. But, it's philosophy is common: of hate, murder and violence.